Over the ten days of the Manchester Jazz Festival, the city centre, bathed for the most part in hot Summer sun, has hosted an eclectic programme of dazzling performances – from the mainstream to the quirky, the established to the up-and-coming, the local to the national and international. This truly is an impressive melting pot of talent which, with an abundance of modestly-priced (or even free) gigs, provides the all-important opportunity to widen discovery and appreciation of the ever-growing, ever-widening genre of jazz. 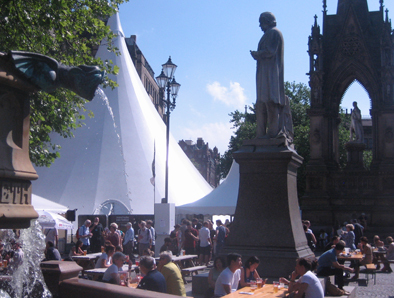 The main hub of activity is centred around the city's Albert Square, beneath the Town Hall clocktower, with its tall teepee concert venue and associated bar, eateries and 'hang zone' attracting keen festival-goers and the curious (plus satellite venues of Band on the Wall, Royal Northern College of Music (RNCM), The Bridgewater Hall, Midland Hotel, Matt & Phred's and St Ann's Church). So – in lieu of medical science affording me the ability to self-clone and attend every one of over 70 gigs – this is a reflection of my own fascinating extended week of experiences in Manchester (our initial 'first two days' report is HERE). The first evening's event – 'BBC Jazz on 3: Introducing' – showcased four emerging, unsigned bands (selected by a panel including Jez Nelson, Jamie Cullum and Gilles Peterson), all sparking great energy and creativity. Quintet 'Moonlight Saving Time' caught my eyes and ears, meticulously delivering their smooth set of vocal-led originals and interpretations (including Chick Corea's 'Open Your Eyes, You Can Fly'), drummer Mark Whitlam and the trumpet of Nick Malcolm also turning in some heady, up-beat improvisation. 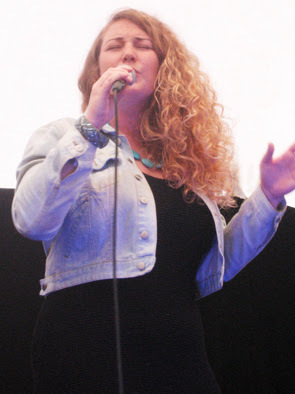 Key to the band's distinctiveness is the commanding and delightful stage presence of singer and leader Emily Wright – assured, enigmatic and clearly feeling the vibe. Their debut EP and live performance suggest this is a band more than ready to cut its first full-length album... something I hope can soon happen. The mjf teepee's first triple bill saw trumpeter Yazz Ahmed's quartet opening Saturday's sounds (with late but very welcome inclusion of drummer Asaf Sirkis). Dave Mannington's hypnotic five-string electric bass and loops, combined with Sirkis's invention (he never fails to impress) and the absorbing vibes sparkle of Lewis Wright, laid down mesmerising time signatures and riffs over which Ahmed improvised sensitively and fluently. The intense afternoon heat then welcomed the stellar line-up of Trish Clowes' Tangent (Chris Montague – guitar; Calum Gourlay – double bass; James Maddren – drums). 'BBC New Generation Artist' Clowes is a consummate, impassioned composer and performer whose relentless, creative tenor soloing is a joy. Her instrumental partnership with Montague (and his wondrous, characteristic 'Troyka' bleeps, scratches and loops, as well as breathtaking melodic runs) is perfect, as is the rhythmic pairing of Gourlay and Maddren. 'Porcupine' provided a spiky duel between Maddren and Montague, and 'Atlas' and 'On-Off' (from Trish's current album) were a pleasure to hear 'live'. Previously unknown to me, Spanish trio Ultra High Flamenco (guitar, violin, double bass and percussion) managed to further raise the temperature with their instantly infectious, hyped energy. The teepee audience loved it, and close-by mums and dads found their babies involuntarily and gleefully connecting with and moving to the amped-up rhythms! 'Fanfare' from Malcolm Edmondstone ushered in an amazing Sunday afternoon set from the Music For Life Big Band – a fantastically-accomplished 25-piece of young players from Cheshire under the direction of Jo McCallum and Alastair McWilliam – supported by a senior rhythm section featuring legendary guitarist (and local lad) Mike Walker. This important Arts Council-funded project skillfully played out a lively programme of new commissions by contemporary composers (which will later be made available for other big bands) – amongst them Gwilym Simcock's 'Beartown Beat' and Dennis Rollins' 'Full Fat Funk' – with the inspirational Walker providing great entertainment, yet never overshadowing the whole... and some strikingly mature improvisation from one of the band's young trombonists. In contrast, from London, one of the country's foremost pianists, Ivo Neame, took to the stage with rising Swedish vocalist Emilia Mårtensson (above) to present an intimate set (at one stage, in competition with a torrential downpour on the teepee's huge canvas). Their evident natural chemistry took us through originals and folksongs, with Mårtensson's lyricism and Neame's progressions so entrancing (the encore, a beautifully pared-down arrangement of 'Narrowboat Man', from the latest Kairos 4tet album they appear on). Rapid gear change, and a UK debut by Luxembourg's Benoit Martiny Band, drummer Martiny leading this heavy thrash rock-based jazz. The initial impression was of an AC/DC tribute augmented by alto and tenor saxes – but they soon dispelled this idea, moving into fast swing with Sandor Kern picking up double bass and Frank Jonas' guitar cleverly resembling Hammond organ. Despite some bemused sections of the audience, the band's set (making Polar Bear sound like chamber jazz!) wowed the Manchester crowd. Later, with a sell-out gig at Band on the Wall, New York's Snarky Puppy proved to be a memorable mjf highlight, as detailed in our review HERE. Admirably, this festival champions the North West's considerable local talent, with RNCM graduates in particular contributing to various line-ups. Monday evening at RNCM provided a great showcase of artists from Manchester's 'Efpi Records'. Including musicians from the label's successful Beats & Pieces Big Band, the early evening event seamlessly segued the Anton Hunter Trio, brother Johnny Hunter's quartet, and – most notably – Roadrunner Honey (Ben Watte on tenor sax/electronics and Ben Cottrell on Rhodes/electronics) who, with drummer and bassist, wove complex soundscapes; their sound satisfyingly redolent, at times, of early Soft Machine. 'Efpi' is continuing to produce some fascinating releases, late Summer into Autumn – certainly worth checking out. Professional development programme, 'Take Five: Europe' (a 'Serious Live' initiative) brought together an international nine-piece band at the RNCM – including clarinettist Arun Ghosh, pianist Marcin Masecki and tuba player Daniel Herskedal – for an evening of varied compositions from its own gifted personnel, presenting unique world/jazz moods to an attentive house. Tuesday evening at the teepee brought a double-bill of music inspired by and integrating literature/spoken word. 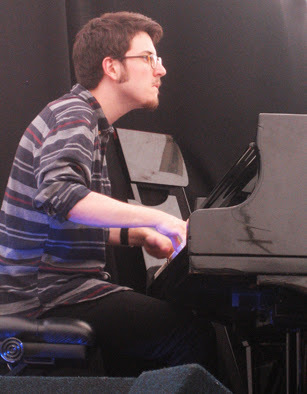 Billy Moon is a chamber quartet of Matthew Bourne's, with piano, cellos and violin. Featuring the voice (read and sung) and clarinet of Seaming To, an appreciative gathering listened quietly (accommodating the Town Hall clock's immovable chimes) to the subtle melding of words and music. Moss Project followed – an enchanting mix of music, stories and poems (album: 'What Do You See When You Close Your Eyes? '), the strong combination of guitar (Moss Freed) and violin/vocals (Alice Zawadzki) drawing the audience in from the Square, and sometimes evoking, for me, an era of Mahavishnu Orchestra and Return to Forever. Sadly, Wednesday evening's much-anticipated Pharoah Sanders Quartet gig was cancelled due to the Grammy Award-winning American leader's ill-health. Thursday brought more free, teepee-packed afternoon gigs, most notably from Bristol-based Kevin Figes Quartet who presented their jazz with great passion and drive, Figes leading on alto and baritone. 'Taiwa', a septet tribute to Moses Molelekwa featuring Claude Deppa and Tony Kofi, set the evening alight with their African-infused grooves, the great spirit amongst the personnel transmitting to an enthusiastic crowd. Against impressive 5-string patterns from bassist Kenny Higgins, the entire band created an intense, happy energy, with Kofi pushing his alto to ever-increasing heights – this was a gig whose rhythms stayed in the mind long after. In the sultry heat of the evening, Band On The Wall hosted a 'Gondwana Records' showcase, the sell-out crowd discovering how well the Manchester label's much-lauded success, GoGo Penguin, translated both their debut album and new material into a live setting. The trio of Chris Illingworth (piano), Neil Blacka (double bass) and Rob Turner (drums) is frequently likened to e.s.t., and cited as an influence... but they have their own character and pulse, and an extremely tight set suggested great things for their imminent follow-up album recording. Gondwana boss, trumpeter Matt Halsall, followed with his sextet, playing the chilled, feel-good jazz of his 'Fletcher Moss Park' album (with cool, shimmering and soloing harp) to a rapt audience. Having unavoidably missed The Cloudmakers Trio, my final day at mjf (Saturday) was buoyed by catching Loop Collective quartet, Dice Factory. Fronted by rich-sounding tenor player Tom Challenger and driven along superbly by Mancunian drummer, Jon Scott, they presented a show which built on their splendid eponymous studio album. With Tom Farmer's bass excellence and Dan Nicholls guesting brilliantly on piano, they delighted in playing their cricket-inspired 'Gooch' (celebrating the player's famous 333 runs total) just a matter of miles from the Ashes test match, which was taking place at the same time at Old Trafford. It's a stand-out on the album, with a quirky, percussive groove created by tenor and plucked bass below the bridge, enhanced by Scott's characteristic hard, clattery, yet precise drum style. The quartet infrequently gig – so it was exciting to catch them enjoying their hour's set, and to learn that a second album is on the way. The evening's well-received jazz/country set from Manchester songstress Kirsty Almeida & The Troubadours was sandwiched between two hugely entertaining, sousaphone-driven brass combos. Again, highlighting the considerable local flavour, Paradox Ensemble and Riot Jazz Brass Band belted out an intoxicating and powerful mix of originals and standards, Riot Jazz pumping up the Last Night party (MC 'Chunky' amiably leading proceedings) with a very different spin on 'Watermelon Man' and even including – to the dancing crowd's pleasure – hefty, clever jazz arrangements of pop classics 'Everywhere' (Fleetwood Mac), 'Don't You Want Me Baby' (Human League) and 'Livin' on a Prayer' (Bon Jovi)! Omnipresent Artistic Director, Steve Mead, and his dedicated team (including many volunteers) – and not forgetting the excellent sound engineering of Mike Smith at the mjf teepee – are to be congratulated on another fine Summer festival, appreciated by artists and audiences alike. This is one of the UK's foremost live jazz spectacles which has proved yet again that it can champion and promote high quality local, national and international music in the heart of the city – long may (and must) it continue. Here's to mjf 2014. Excellent review! Moonlight Saving Time especially good.